Halloween Horror Nights IX was the ninth annual Halloween Horror Nights event in Orlando. Located in Universal Studios Florida, the event was advertised with a depiction of The Mummy calling it the “Last Gasp”. 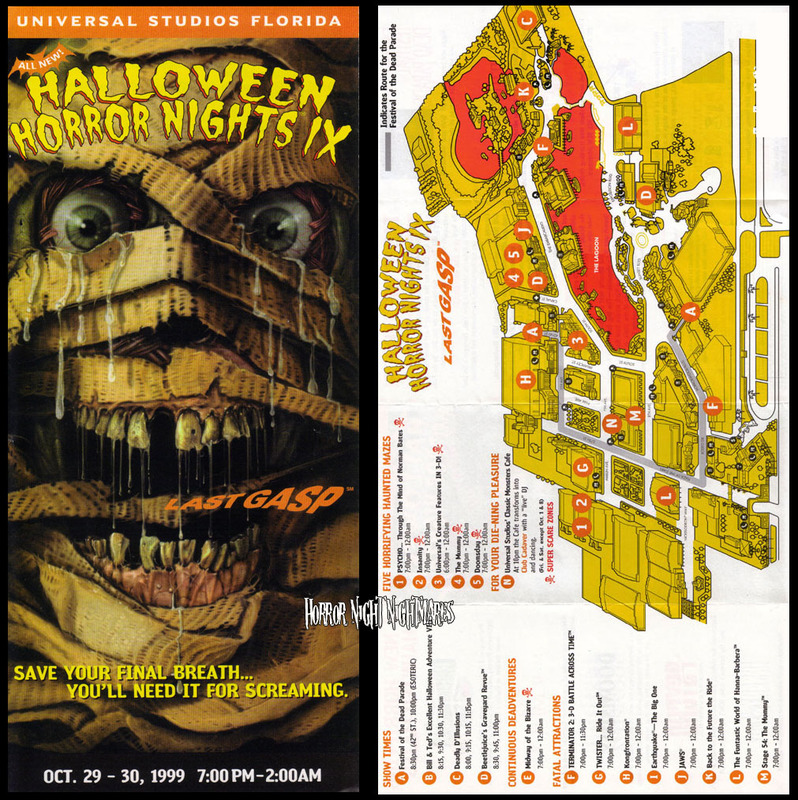 The event featured five mazes, including the first 3-D maze in Halloween Horror Nights history, one scare zone, two shows, and a parade, and was held for 19 nights. Go on a journey through the warped underground of New York City as the impending arrival of the Millennium brings out the worst in the city that never sleeps. Revenge-crazed inmates are running the asylum! Try and make your way through a carnival where mirrored hallways, darkened corridors and hideous creatures make your escape unlikely. Experience the chillingly violent images that torment Norman’s soul. For heavens sake, DON’T GO IN THE SHOWER! Universal’s Creature Features in 3-D! Put on your 3-D glasses, as some of Hollywood’s worst nightmares literally jumpy off the screen of a neighborhood movie theater at Florida’s first ever 3-D maze. Party on as those two most excellent time traveling dudes, Bill & Ted, are back again in an ALL NEW adventure. You’re front row center as a heavy metal band of hideous creatures takes to the stage in a “live” show of monster rock, grunge and madness. You wont believe your eyes as you witness this spellbinding display of unbelievable effects, magic and shocking illusions. Bigger and better than ever! Grab your broomstick and witness the “Season of the Witch”!